Tripod Screens are like ready-made screens that can be un-rolled and hooked on to Tripod Stands. These are portable (when smaller in size) and can be set up in quick time (a few minutes). The flip-side is they do not give an aesthetic look and may sometimes not be appropriate in a professional setting / event. 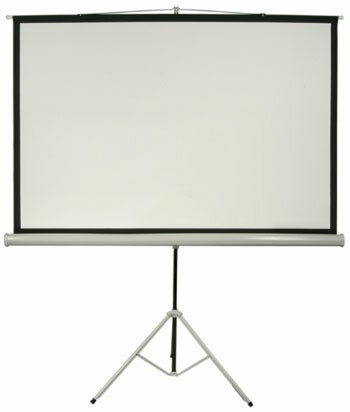 Here is a picture of a Tripod Screen of size 4 feet X 6 feet. Screen sizes of 6 feet X 8 feet require 2 Tripod stands to hook onto instead of one. 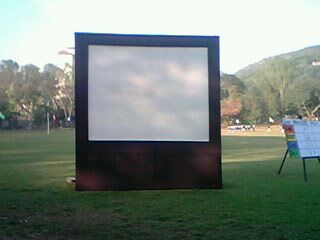 Only Front Projection with Tripod Screens. Masking Screens are custom-made and do not come ready-made. Instead Masking screens require about 2-3 people to fix them up in a wooden frame that takes roughly 2 hours to complete. Masking Screens have a much cleaner and professional look and an aesthetic appearance. On the flip-side, Masking Screens cost more to rent compared to Tripod Screens. If you have a sufficient budget and an audience to impress, Masking Screens are the way to go. 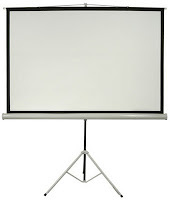 Both, Front and Back Projection is possible with Masking Screens. Back Projection allows placing the Projector behind the Screen, so the Projector is not visible to the audience.